South End’s new spot The Waterman is all about good company, good seafood and the salt-of-the-earth people who make it possible. Paul Manley would say he stumbled into an education on oysters. In 2007, he was charged with opening Pearlz Oyster Bar in Charleston, S.C., long before his own tango with restaurant ownership. Andrew Chapman (left) and Paul Manley are co-owners of The Waterman in South End and Sea Level in uptown. “I had a lot of homework to do,” he recalls. At the time, his boss depended on Manley to know his stuff, which eventually paid off for that business—and for Manley’s future concepts. The 53-year-old now owns Sea Level, the upscale raw bar and restaurant which opened in uptown Charlotte in 2016, and recently divested from a near decade-long partnership in Growler’s Pourhouse and the Crepe Cellar, to birth Sea Level’s kid cousin: The Waterman Fish Bar. To that end, the Waterman Fish Bar accommodates those sentiments, a casual space to gather and dine from a menu that includes sandwiches, “shareables,” and a raw bar featuring Manley’s signature Sea Level oyster, derived from a partnership with oyster farmers in Sea Level, N.C. The space is airy, open, and light-filled with seating for 80 inside, a cheery outdoor patio, and a rooftop bar in the works (not yet complete when they opened in mid-October) with lounge area and an unobstructed view of the Queen City, which is becoming ever harder to come by as city development continues to surge. Upon entering, guests are greeted by a stunning mural of a waterman created by artist Sarah Helser. Manley says the image encompasses the essence of a waterman: a person who makes their living off the water––oysterman, shrimpers, fishermen—real salt of the earth people. In this depiction, the waterman rests with a cigarette in hand, skin weathered from the wind and sun, as he presides over the restaurant space. A raw bar with seating offers up a small but dynamic selection of oysters, which Manley says focuses on the different regions of the United States where oysters thrive. The menu aims for selections meant to be shared and eaten with one’s hands. Tacos are filled with an abundance of choices, including crispy oysters, grilled fish, and blackened shrimp on homemade corn tortillas or a scallion pancake. Go for the scallion pancake, Chef Charles Landry’s twist on a flour tortilla. The Fisherman’s Pick is a hearty beer-battered sandwich (think fish-and-chips style) to be washed down with a Nautical Mule—one of two cocktails on draft—made with vodka, ginger, blackberry, star anise, and lime. 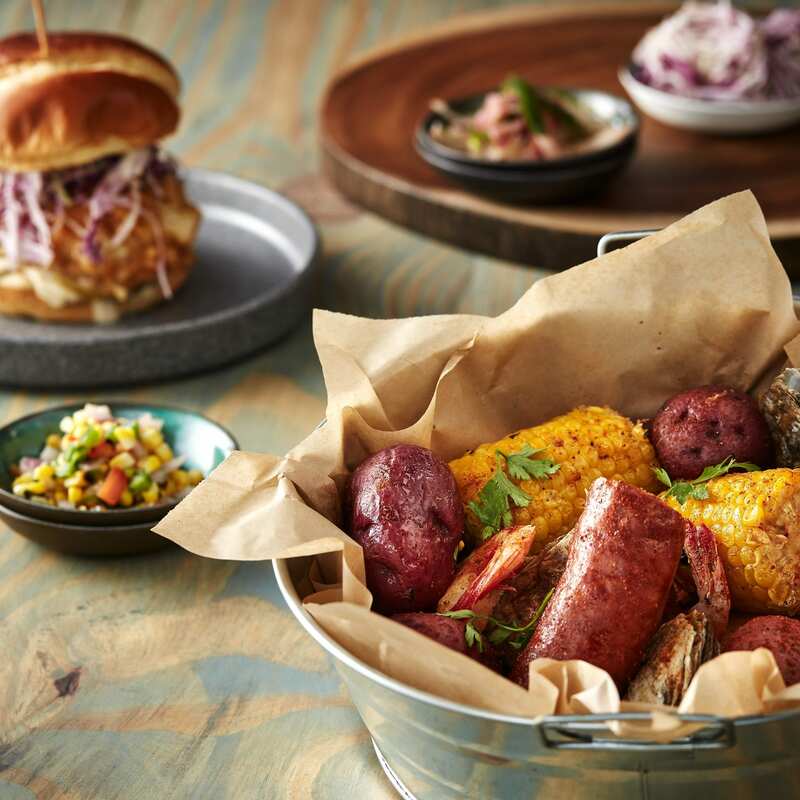 The low-country boil is another communal choice, large enough for two people, cooked to order with new potatoes, sausage, corn on the cob, steamed oysters, and peel and eat shrimp. For the non-seafood eaters, there are burgers, hot chicken sandwiches, and a brisket plate with gravy. Nautical details dot the space, from the light fixtures to the wood accents and the nautical maps that plaster the bathroom walls. Just like the waterman on the wall, and the kind of crowd that first drew Manley to his love of oysters, the Waterman is a place to gather without pomp, a neighborhood spot to enjoy an easy meal with those in your fleet. ← Meet the Charlotte Ballet’s Chelsea Dumas, the Sugar Plum Fairy in this year’s Nutcracker.